When a friend or family member said the “right thing” during our 93 day NICU stay, it was amazing. We felt supported and loved. Here are some examples of comments that made us feel better. We hope our experience can help you figure out the “right thing” to say to someone who is dealing with a medical crisis. Even though our baby was born sick, we are still new parents. We would love to hear the words “I know this is not what you expected, but congratulations!” This way, you are acknowledging that things did not go as planned but you are also helping us remember that we had just had a baby and that deserves to be celebrated. We realize that it’s hard to know what to say to us. That’s ok – we are not the best conversationalists right now, either. We would love it if you sat with us for a while in the hospital cafeteria, no words necessary. We would appreciate it if you sent us a card or note letting us know that you’re praying for our family. No matter your faith, we appreciate all prayers and positive thoughts. In the case of an extended NICU stay, it can be pretty jarring to realize that life goes on for everyone outside of the hospital walls. We need to know that you’re still thinking about us! Please keep emailing or texting – even if we don’t respond. 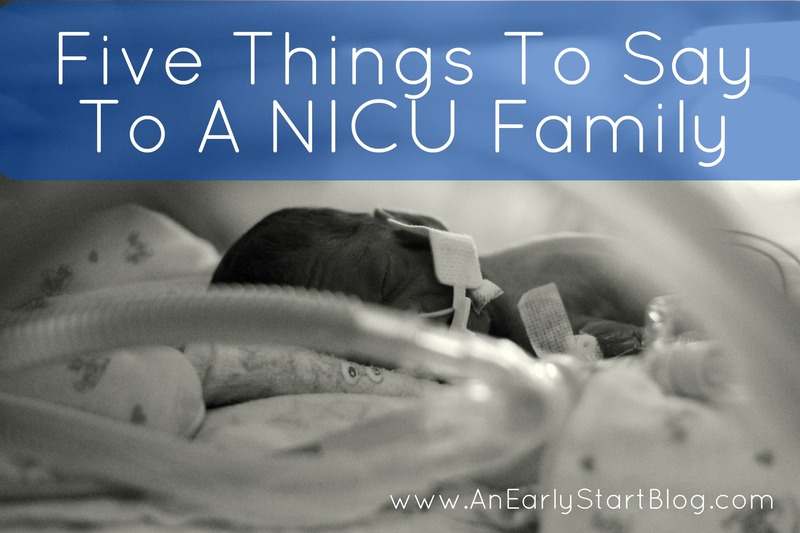 Keeping our NICU baby healthy is a top priority for us. If you will be a part of our lives, keep yourself healthy, too. Please don’t visit our home if you have a runny nose, cough, sore throat, or any other sick-y feeling. It’s simply not true that preemie babies “need to be exposed” to germs. Also, please respect our wishes when it comes to vaccines and our decision to isolate our preemie once he comes home. Sometimes it’s easy for an outsider to think “what’s the big deal?” Even if you think you would handle our situation differently, we are doing the best we can at the moment. We don’t want to hear comments that discount our experience. For example, if you’re tempted to say “Don’t worry – your baby will be just fine.” or “I have an uncle who had a friend who had a preemie and he’s doing great!” Don’t. Every preemie is different and we don’t know what the future holds for our baby – and neither do you. It doesn’t make us feel better when you downplay our situation. Our world has just been turned upside down and we are dealing with a lot of unknowns. By simply acknowledging that, you can help us feel less alone. Thank you for being here for us. We appreciate everything you are doing for our family right now. We know how different this is for you. It’s different for us, too. We are keeping hope that our baby will get better and come home soon. Until then, we need all the help we can get. If you like this post, sign up to see more! Please follow our blog by email (on the right side bar), or like us on Facebook. I have a granddaughter. A beautiful child, both inside and out. She was born with CDH. She was taken to the UVA . God has blessed her throughout her ordeal. Her parents and grandparents were with her through it all. So many family and friends encouraged them on. She is a senior graduating in May 2016. She will be going to Glenville State, WV., taking up graphic design-digital art. She, along with God, can do it. If you don’t vaccinate your child, what about the respect to everyone else’s children who may become ill due to your negligence?? Exactly! We agree that vaccines are very important! Thank you for your post. We had a premie baby in 1969. Even my parents didn’t want to congratulate us. He was 1 lb & 15 Oz. for those days that was really something. he now is 190lbs. and is in fairly good health. Frances, thank you for your comment! Wow – stories like yours always inspire me. 1 lb 15 oz is really something even now – your son had a spark in him. What a fighter! A simple (and humble) acknowledgement of the reality of someone’s situation (whatever it may be) goes a long way in showing them that you care for them even as you join them in the unknown. It validates the weight and reality of their deepest fears and concerns. Without question, it’s a scary place to be, but when words like these are spoken…there is true comfort offered because it feels a lot better when you know you’re not there alone. Right on, Jason! I never find it very helpful when people compare our situation to another one. THIS is my pain, my grief, my fear and it’s all real. When someone acknowledges that, it all feels a little bit easier to handle.